But if a hunter was involved, Chee knows the prey was intentionally human. This belief is shared by the “Legendary Lieutenant” Joe Leaphorn, who once again is pulled out of retirement by the possibility of serious wrongs being committed against the Navajo nation by the Washington bureaucracy. Yet it is former policewoman Bernadette Manuelito, recently relocated to Customs Patrol at the U.S. — Mexico border, who possibly holds the key to a fiendishly twisted conspiracy of greed, lies, and murder — and whose only hope for survival now rests in the hands of friends too far away for comfort. Bestseller Hillerman’s 16th Chee/ Leaphorn adventure offers deeper intrigue and a tighter plot than his previous entry, The Wailing Wind (2002), in this enduring series. When the body of an undercover agent, who’s been looking for clues to the whereabouts of billions of dollars missing from the Tribal Trust Funds, turns up on reservation property near Four Corners, Navajo cop Sgt. Jim Chee and Cowboy Dashee, a Hopi with the Federal Bureau of Land Management, investigate. But the book’s real star is officer Bernadette “Bernie” Manuelito, Chee’s erstwhile romantic interest, now working in the New Mexico boot heel for the U.S. Border Patrol. The miles have only strengthened her feelings for Chee-and vice versa. A routine patrol puts Bernie on the trail of an operation involving some old oil pipelines that connects to the Four Corners murder. Meanwhile, Joe Leaphorn is checking into the same murder from another direction. The three lines converge on a conspiracy of drugs, greed and power, and those who most profit, including the “sinister pig” of the title, will stop at nothing to keep it a secret. 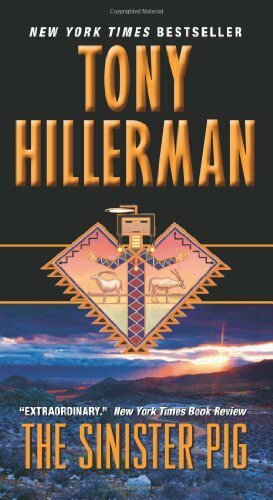 With his usual up-front approach to issues concerning Native Americans such as endlessly overlapping jurisdictions, Hillerman delivers a masterful tale that both entertains and educates. During the investigation of misappropriation of the Indian Tribal Royalty Trust an undercover agent is murdered in tribal lands. Someone has been syphoning off royalties from Indian lands. Readers learn of a powerful and corrupt member of congress who will do anything to fulfill his greed. While retired Joe Leaphorn and Jim Chee work for a solution to the murder and mystery Bernie Manuelito turns up on the New Mexico border with Mexican border working as a customs agent with the Border Patrol. Bernie trails a suspicious vehicle to a locked gate. Owners of the property strictly enforce a no trespassing policy even though Bernie attempts to use her authority to pursue suspects. Through dogged determination she manages to get into the property where she takes some photos as evidence and others simply for personal interests, shooting exotic animals. Her photos draw the interest of people on the property and work their way into the hands of some powerful criminals. The photos eventually place Bernie in the crosshairs of the corrupt politician and those who work for him. The Sinister Pig presents a complex mystery that relies heavily on the skill of retired Navajo Tribal Police Lt. Joe Leaporn to connect the dots. It’s a classic Tony Hillerman mystery, well worth reading. Typical Hillerman, the only mystery set in modern day- series of American Indian culture wrapped in Traditional and Ancient ethnology that held my interest from start to finish, you will love the characters (the good guys) and despise the (bad guys) and see the unconscionable results of the Indian downfall, and hopeful transitions made for their future in transition. I recommend obtaining all of the series and read them in order, starting with the “Blessing Way”. Officer Bernadette Manuelito is a good investigator – intrepid, clever and resourceful. But it’s these very qualities that seem to get her in difficulties. Now she’s no longer a cop working for Sergeant Chee at Shiprock. Partly to forget Chee, who’s failing to get romantic, she takes a job on the Mexican border. There she encounters some shady characters and dicey situations on a mysterious ranch stocked with exotic game animals. Chee meanwhile is occupied with a mysteriously well-dressed unidentified dead body. Leaphorn too gets involved in this case. But neither is too busy to worry about Bernie and get involved in her complications. Bernie gets a quick education on border patrolling, and so do we. There is a wonderfully despicable villain in the plot, and an unexpected hero. Chee’s best friend Cowboy Dashee also plays a role. He’s an Apache and prone to poke fun at Navajos, the heredity enemy of his tribe. His quips are always amusing. The Leaphorn and Chee mysteries are consistently delightful, with clever plots, tense action, engaging characters, terrific atmosphere, and always a fascinating picture of Native American culture in New Mexico. But I will add that my husband, a fellow Hillerman fan, found this book a bit weak with the contrivance of too many coincidences. I also read in a book by Anne Hillerman that The Sinister Pig gave Hillerman the most trouble of all his books, because he was less familiar with the location. I love these books so much that I’m not critical of the contrivances. But see what you think.